Donald Brooks (1928-2005). Coat, ca. 1966-1967. Museum of the City of New York, 98.62.1. The Museum’s Costumes and Textiles Department recently completed a thorough assessment of all 1960s garments in the collection, identifying those pieces that exhibit design and craftsmanship of the highest quality, add significant insight into the interpretive stylistic trends of New York City fashion, and are the finest examples of the type of costume. These garments, worn by notable women and created by legendary designers, vividly bring to life an intriguing era and include afternoon dresses, evening gowns, miniskirts, coats, and jackets. 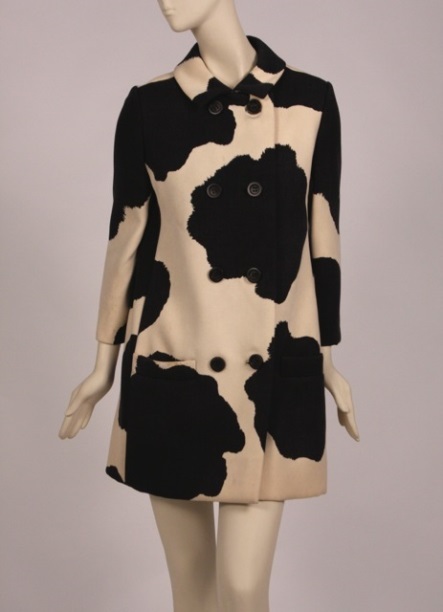 Women’s fashions of the 60s underwent radical transformations, in fabric, form, and fabrication, reflecting the great societal changes of the time, including the emergence of a youthful counterculture and the women’s liberation movement. Attributed to Norman Norell (1900-1972). Sailor Dress, 1968. Museum of the City of New York, 84.14.16AB. The Museum has submitted a proposal to digitally photograph approximately 146 dresses from this decade in order to share them publicly on the Collections Portal, and is now a finalist the Heritage Trust project, a social media contest sponsored by EMC Corporation – please vote for us here! New York City has long been recognized as an international fashion capital and access to this collection will provide a window into styles and trends that proliferated throughout the nation. Phyllis Magidson, Curator of Costumes and Textiles, recently shared accounts and observations of the dresses featured in this post, which represent just a small sampling of the highlights proposed for inclusion in this project. Norman Norell’s designs were dualistic in personality, a fusion of wholesome American fashion metaphors and worldly sophistication. Recipient of the first American Fashion Critic’s Award (commonly remembered as the Coty) in 1943, Norell was instrumental in elevating the stature and credibility of American design during World War II. 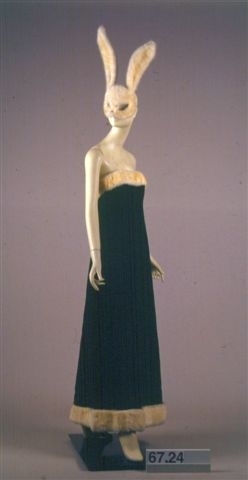 Halston (1932-1990), for Bergdorf-Goodman. Evening dress and mask, 1966. Museum of the City of New York, 67.24AB. Yet another dress in the collection with celebrity provenance is this Halston evening gown worn by Candice Bergen to Truman Capote’s storied 1966 “Black and White Ball” at the Plaza Hotel. 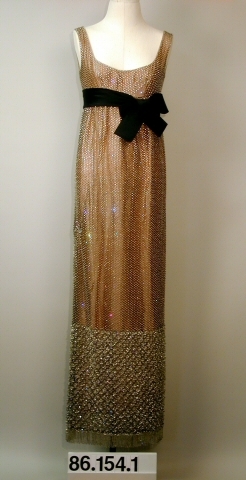 Twenty year old Candice Bergen had only recently made her film debut in “The Group” when she found herself amongst the 540 guests invited to attend author Truman Capote’s “Party of the Century.” This dress was a gift from Bergdorf-Goodman, a dress exclusive for their Boutique On the Second Floor. 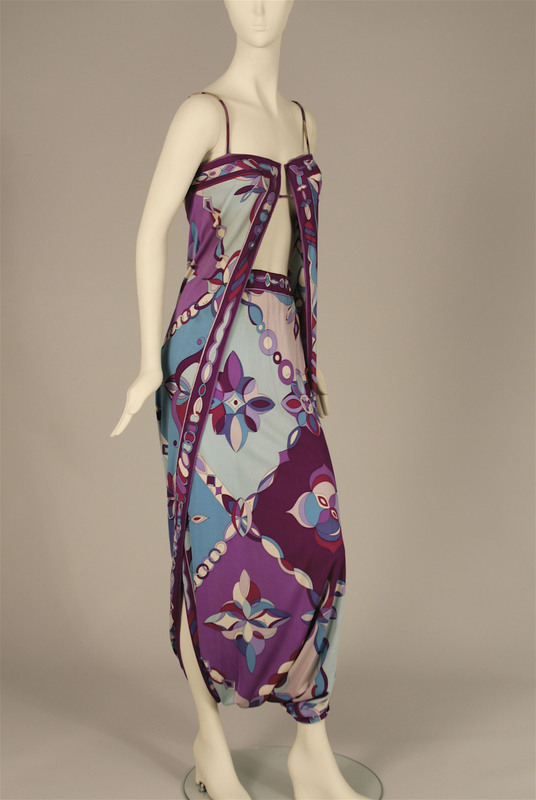 Emilio Pucci (1914-1992), for Saks Fifth Avenue. Evening costume, mid 1960s. Museum of the City of New York, 95.148.3. 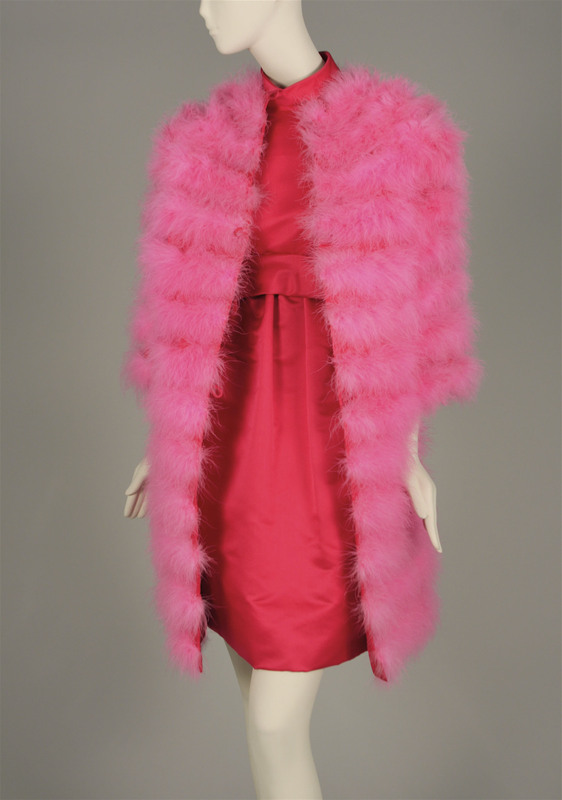 Laura Johnson, a significant donor to the Museum’s Costumes and Textiles Collection and wife of Saks Fifth Avenue Chairman of the Board and CEO (1969-1978) Allan Raymond Johnson, orchestrated the selection of her wardrobe to reflect the array of labels available on the store’s sales floors. Geoffrey Beene (1927-2004). Dress, late 1960s. 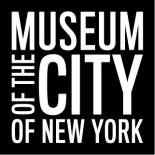 Museum of the City of New York, 88.44.3. Although she dressed heavily from the collections of such iconic New York designers of Geoffrey Beene, James Galanos, Ben Zuckerman, Donald Brooks and Pauline Trigere, she added international intrigue by interjecting such labels as Andre Courreges and Emilio Pucci. Johnson once addressed the boggling quantity of her acquisitions by stating that in his position, Mr. Johnson did not permit her to wear a garment after she had been photographed in it. Judging by the front row perch she occupied at the city’s most notable fashion shows, it is clear that she was quite successful in commanding the photographer’s lens. Geoffrey Beene (1924-2004). 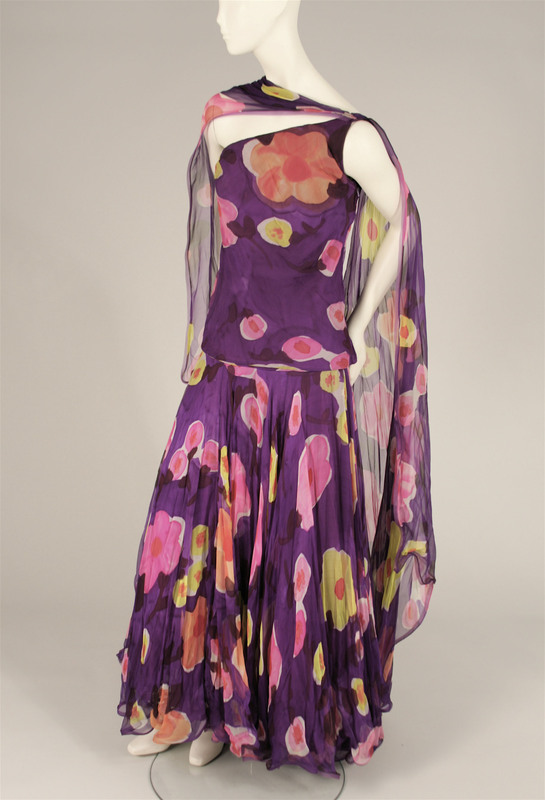 Evening ensemble, “American Beauty Rose,” 1967. Museum of the City of New York, 67.131AB. 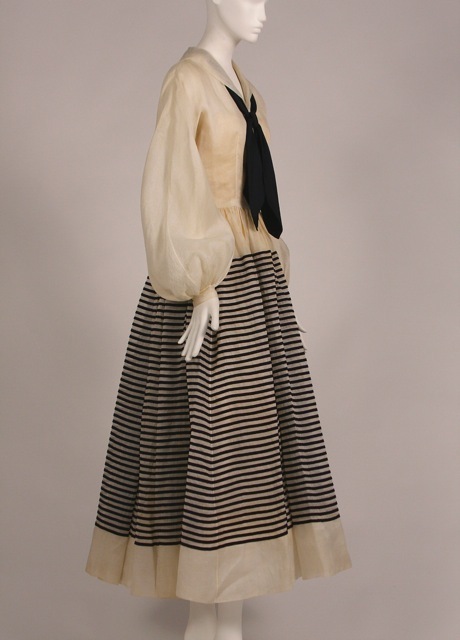 Johnson’s dress above, a design of Geoffrey Beene, represents another notable designer of the period. One of the inaugural group of eight designers immortalized on Seventh Avenue’s Fashion Walk of Fame in 2000, Geoffrey Beene directed his technical skills as well as creative prowess to the production of clothing that worked for the needs of the American woman. Acclaimed for his versatile, highly functional designs, Beene sought to create a lighter, more modern breed of garment. He is cited as “a designer’s designer…one of the most artistic and individual of fashion’s creators” on Seventh Avenue’s Fashion Walk of Fame. Geoffrey Beene’s designs blurred the distinction between comfort and luxury, naivety and sophistication. Although soft-spoken in manner, Mr. Beene’s unfaltering command of his art is clearly evidenced here by the strong design and startling palette of this ensemble. Pierre Cardin (b. 1922). Coat and skirt ensemble, ca. 1969. Museum of the City of New York, 78.26.12AB. Despite a new found confidence in the creative prowess of New York’s 7th Avenue, Americans of the 1960s were still entranced by Paris fashions, specifically the designs of Pierre Cardin and Christian Dior. The impact of the space-age and its sci-fi aesthetic is obvious in the design and fabrication of this mini-ensemble by Pierre Cardin to the left. Not only is its geometric cut and shape consistent with the reductive aesthetic the day but the high-gloss red vinyl used for its execution is quintessentially 1960s. Already recognized for his superb tailoring, Pierre Cardin succumbed to the experimentalism of the youth culture, responding with this cutting edge (and water repellent) vinyl tour-de-force . Marc Bohan (b. 1926) for Christian Dior. Evening dress, 1968. Museum of the City of New York, 79.71. The Dior dress to the right belonged to Wallis Simpson, Duchess of Windsor, one half of arguably the most highly publicized romance of the 20th century, in which the King of England surrendered his throne in order to marry his beloved. A fixture on International Best Dressed lists throughout the 1940s and 50s, and periodically criticized for her extravagant shopping sprees – particularly during the Second World War – women worldwide emulated the Duchess’s polished style. As Dior’s Creative Director, Marc Bohan resisted new fashion trends of the late 1960s to create this regal timeless gown, befitting the composure of his Best-Dressed Hall of Fame client. Marc Bohan (b. 1926) for Christian Dior. Mini dress, 1968. Museum of the City of New York, 71.79.3. Bohan designed this dress to the left for Sunny von Bulow, another half of an infamous couple. Nicknamed for her childhood disposition, heiress and socialite Sunny was tragically associated with one of the most notorious trials of the 1980s—that of her husband, Claus von Bulow, who was convicted but later acquitted of her attempted murder. The story of adultery, wealth, and murder in high society dominated the headlines, and the case was the first criminal trial to be televised in the United States. This dress harkens back to brighter moments following Sunny’s 1966 marriage, when she and von Bulow were considered amongst this country’s most socially glamorous couples. Dior’s Marc Bohan selected a confectionery palette appropriate to Mrs. Von Bulow’s pale coloring for this billowy-sleeved mini dress. These garments represent just a handful of items that will be digitized a result of a successful Heritage Trust award. If you like the designs you see here, please help the Museum move forward with this project by voting here. The photography generated by this project will be of the same detail and quality as that produced for the online exhibition – Worth/ Mainbocher: Demystifying the Haute Couture. Stay tuned to our Facebook page, for more highlights from this collection. 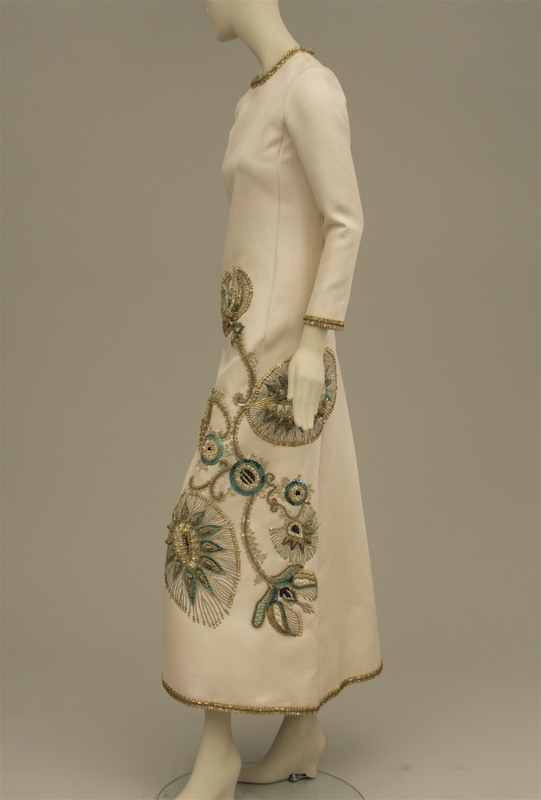 This entry was posted on August 5, 2014 by Lindsay Turley in Costumes and Textiles, Digital Project and tagged 1960s, Bergdorf-Goodman, Black and White Ball, Christian Dior, Donald Brooks (1928-2005), dresses, Emilio Pucci (1914-1992), Geoffrey Beene (1927-2004), Halston (1932-1990), Marc Bohan (b. 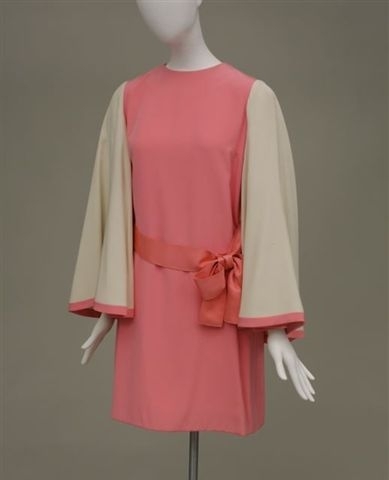 1926), Mod fashion, Norman Norell (1900-1972), Pierre Cardin (b. 1922), Saks Fifth Avenue, Truman Capote.